Heading west from Lake Baringo the countryside was at first dry and arid reminding us of the stretch on the Orange River between Noordoewer and Aussenkehr in Namibia, but then with higher ground it became lush green as we neared Kabarnet. Thanks to the fluorspar mines the gravel road to the south was excellent and amazed us as we zig-zagged up 24 hairpin bends to the Elgeyo escarpment, at an altitude of 2 700m. A section of the hairpin road. We headed for these highlands not only because we had been advised of their beauty but also since we wanted to enter Ethiopia to the east of Lake Turkana. As there is no border control there, we had to get a pre-dated exit stamp in our passports at Immigration in Eldoret. Driving from there north we passed through Iten (the high altitude training town of the Kenyan running champions) towards Tot. The rural countryside at this altitude is beautiful, being well cultivated with maize, wheat and vegetables and cattle and sheep grazed next to the road. Just about every inch of the escarpment is cultivated. 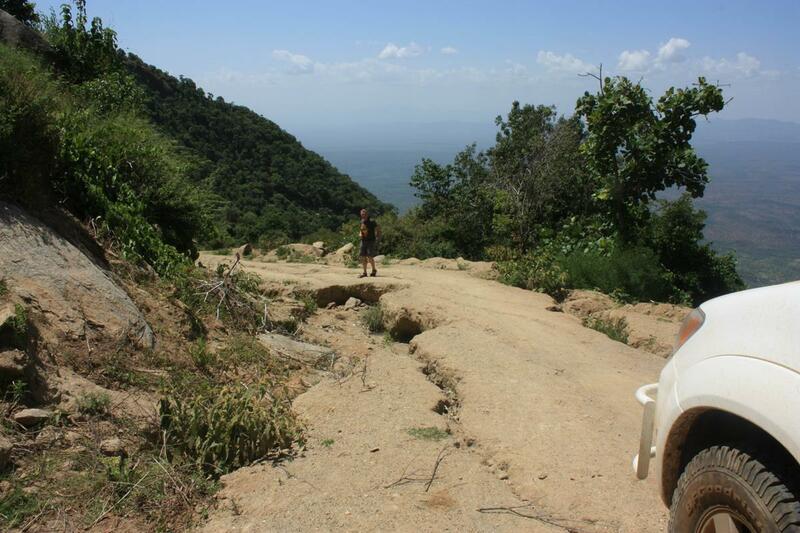 We had lunch in a pristine patch of forest near Matira and shortly afterwards were treated to the dramatic view east of the steep drop off the escarpment into the Rift Valley. We were once again astounded by the dramatic landscape, reminding us of the majestic mountains of Europe. 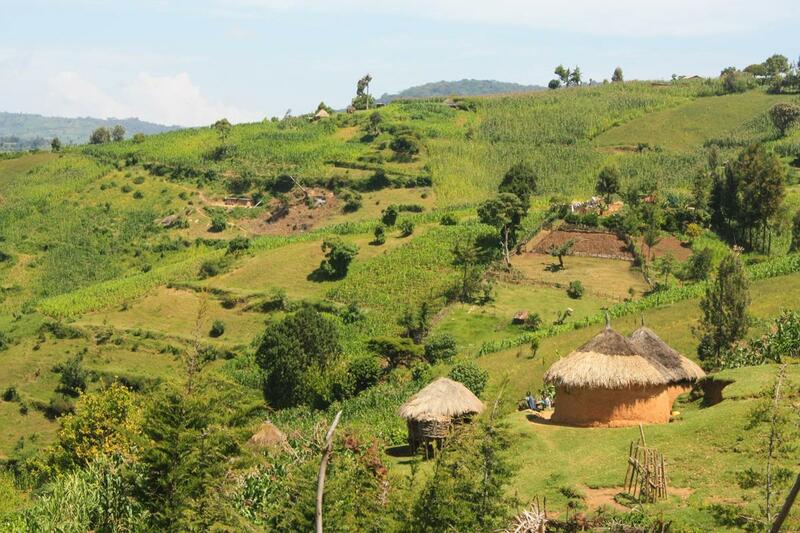 The hills are dotted with round huts. This is fruitful country with a high rainfall; almost every inch of the escarpment is under cultivation. To save the brakes we engaged low range 4WD and eased our way down, noticing that the road became increasingly less well-defined. Eventually, with the Hilux stopped downhill at about a 20 degree angle and well before we reached the valley floor, we inspected a deep wash away that left too little road for our tyre width. The road is washed away and there is a steep drop down the escarpment. The wash away left too little road surface for the wheels. We turned around and ground our way back up to Kapsowar and then east towards Sisya, with more breathtaking scenery. Then, with another amazing view we started descending again, the twin tyre tracks soon ominously changing to a single motorcycle track. We could just hope that the road surface would hold out. 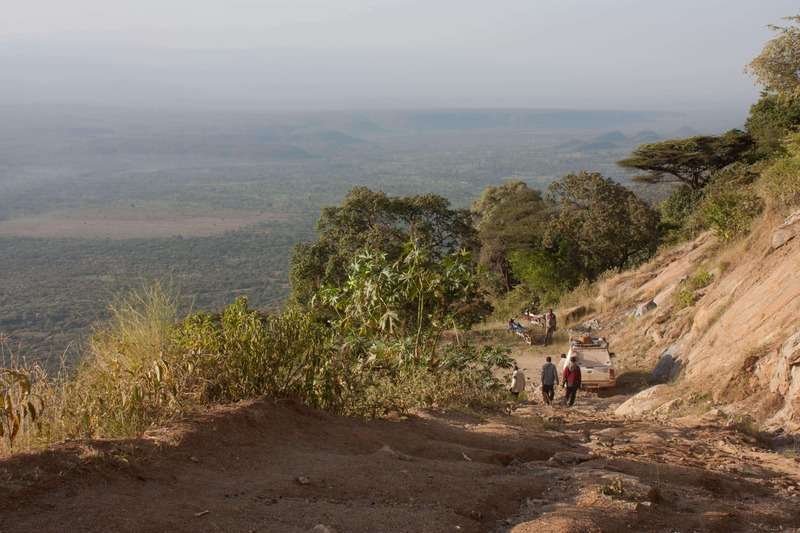 By this time it was late and knowing that we would have to bush camp, we decided to find a spot with a beautiful view of the Rift Valley along this quiet, dramatic descent. We stopped at a wide hairpin about two-thirds of the way down, had tea and set up camp before it got dark. 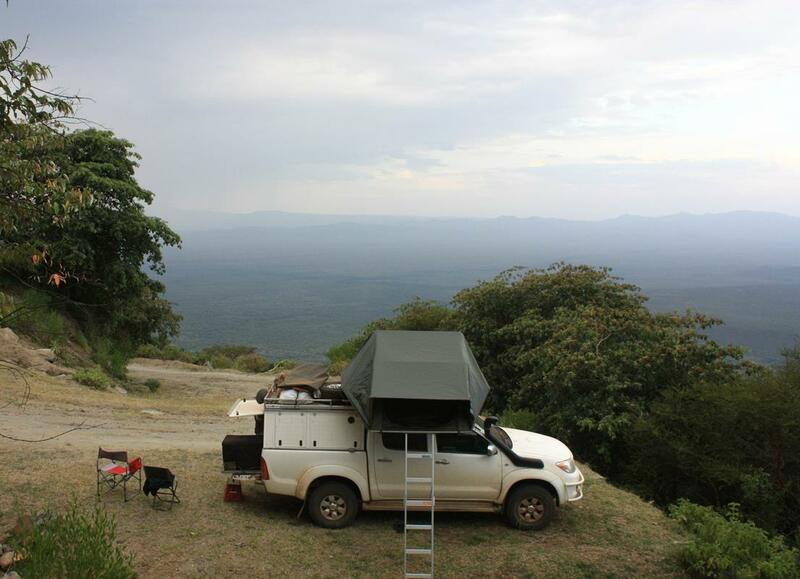 Our camping spot for the night had a beautiful view over the Rift Valley. Several motorcyclists passed by greeting us with their cheerful ‘Jambo’. One of the last to do so carried a stately, elderly passenger who introduced himself as the Chief of the area. Feeling a bit awkward as we had already pitched camp, we asked for his blessing and were surprised when he expressed concern for our safety, suggesting that we pack up and drive two kilometres back to a village. Already well established there, with supper cooking, Pete’s request that he instead provide us with security for the night at an agreed rate met with approval. Not long after dark a motor cycle came blaring down the road to a true African beat. Three cheerful men got off the bike and the self-appointed spokesman, Jackson, introduced them as our security force for the night. 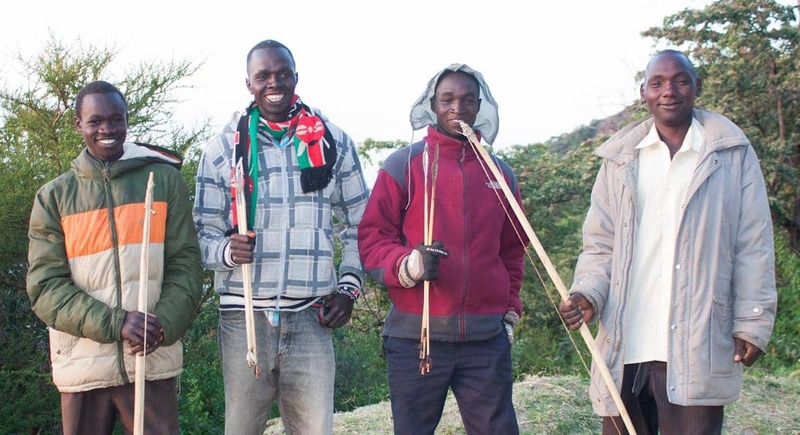 They proudly showed us their bows and arrows, which looked as if though they were made shortly before their arrival and then gathered wood, started a fire and settled down across the hairpin bend for the night. Shortly after we had fallen asleep, another motorcyclist arrived, and we saw when we got up at dawn that our security force had now grown to four guards. Our cheerful security guards with their bows and arrows. Coffee and tea refreshed us all and the youngsters, in high spirits, insisted that they wanted to see us safely down the mountain as the most difficult sections lay ahead. From the top it took 40 hairpin bends and a descent of about 1 400m to arrive at the district road in the valley, leaving us relieved to get off the high ground without having to take another detour. Our guards escorted us through the challenging patches down the escarpment. Before parting with our guards we exchanged telephone numbers and the next day we missed calls from both Jackson and Chief Marakwet. 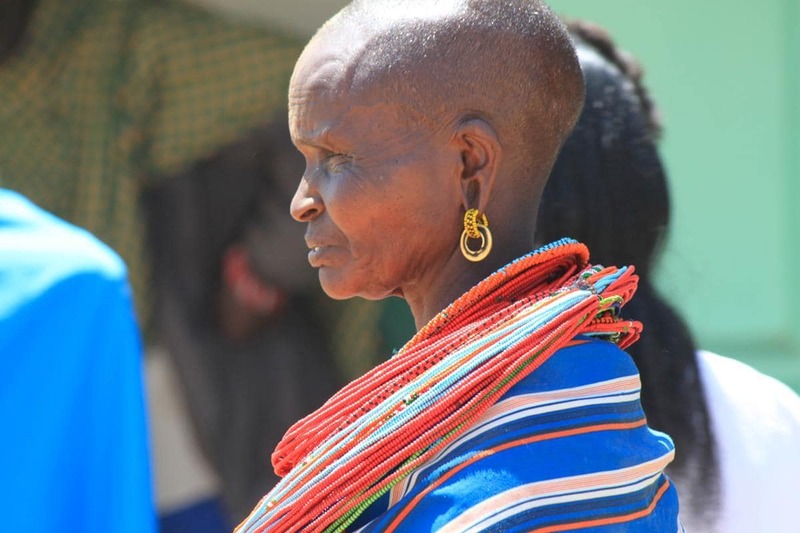 However we were very touched to receive an SMS from the Chief: “I, Chief Marakwet, want to thank you. God bless.” Superb, polite and friendly people! The advent of the inexpensive Chinese motorcycle appears to have revolutionised travel in all but the poorest parts of Africa that we have seen. These small, light machines serve as transport for a variety of goods including livestock, furniture, produce and also enormous loads of charcoal or wood stacked high. They also operate as taxis; the maximum load we have seen being three people and a goat. On the steep slopes of the edge of the plateau the motorcycle reigns, easily negotiating the narrowest available track. This explains why the most difficult sections of the road down the escarpment turned into a one spoor track. 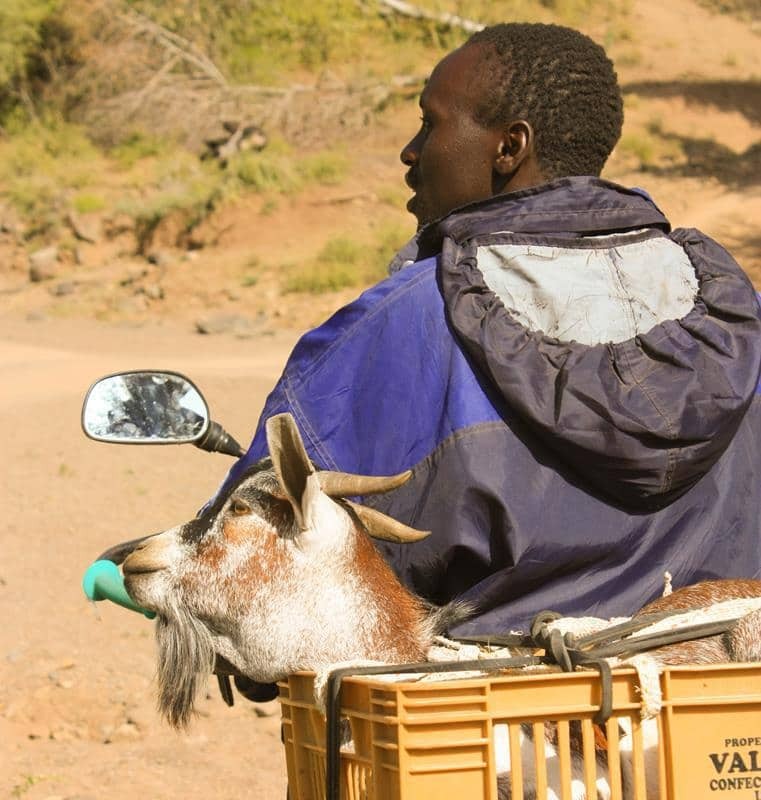 A man transporting his goat. 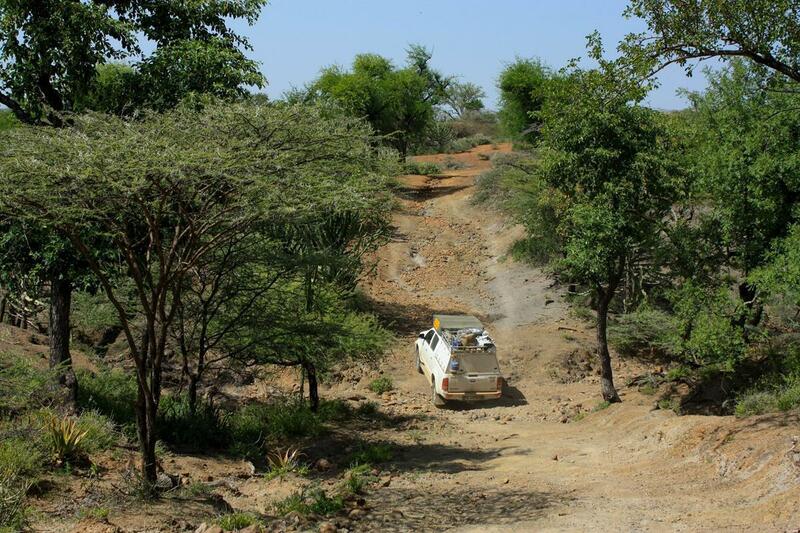 Our destination for the day was Mugie Ranch which lay east on the Nairobi/Turkana road. 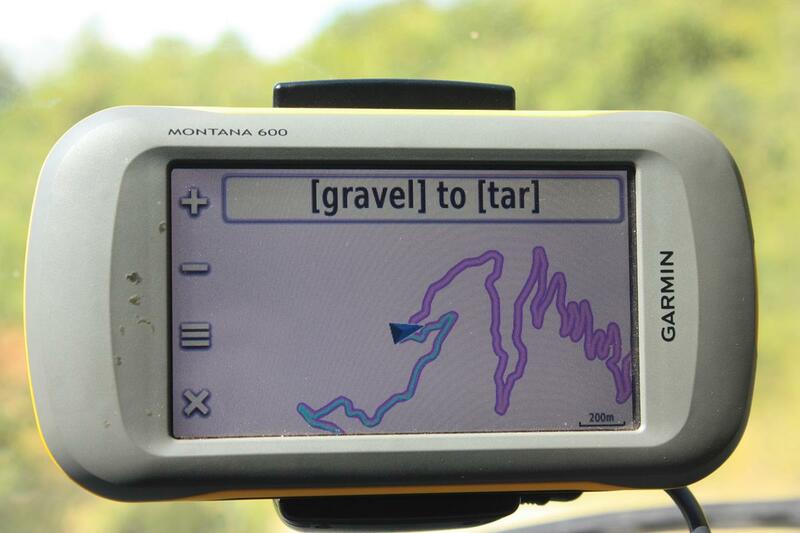 However, no roads lead directly to it, so with no firm information regarding road conditions we chose what we thought would be the most appropriate, albeit meandering route. We travelled through some beautiful back roads. Once again a well established road gradually got worse as we got deeper into the bush, in this case hair pinning into and out of small river valleys, cutting across the grain of the hillsides for kilometres, its surface a jumble of rock. During our coffee stop an old man walking past asked for a lift to town where his five children were at school. When we reached the tarmac and our ways parted he was insistent that there was no direct route through to Lake Baringo. 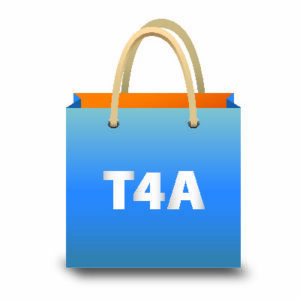 Fortunately we ignored his and others’ advice and persevered, following the T4A map. A few kilometres further we again turned onto gravel and made another very steep and rocky descent in the right direction. 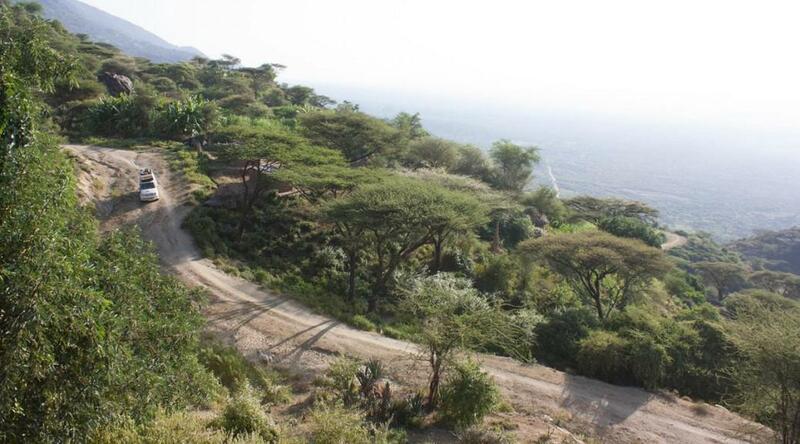 Mugie Ranch is at the heart of the Mugie Conservancy. Upon driving into Mugie Ranch we passed by elephant, zebra, giraffe and impala. Apparently this protected area also has big predators like lion. Our arrival at Mugie Ranch was delayed as we had to secure the bash plate whose two rear bolts had fallen out, leaving it clanking ominously. Being too late to enter the formal camp we set up on a patch of grass in front of the ranch buildings, cooked and then got into bed to the sound of an elephant trumpeting in fury some way off. The next morning we were disappointed to learn that Mugie Ranch only caters for pre-booked guests at their tented camp and lodge, and it wasn’t possible for us to camp there. We filled our water tanks and were very grateful for the ranch mechanics who affixed the bash plate properly. 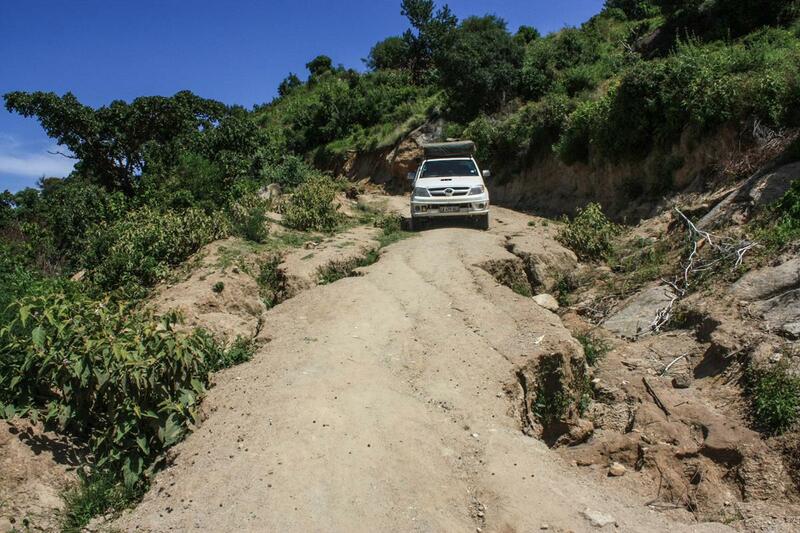 We then set off along the rocky gravel road to Maralal. Maralal is a small town known for hosting the annual National Camel Derby in August. 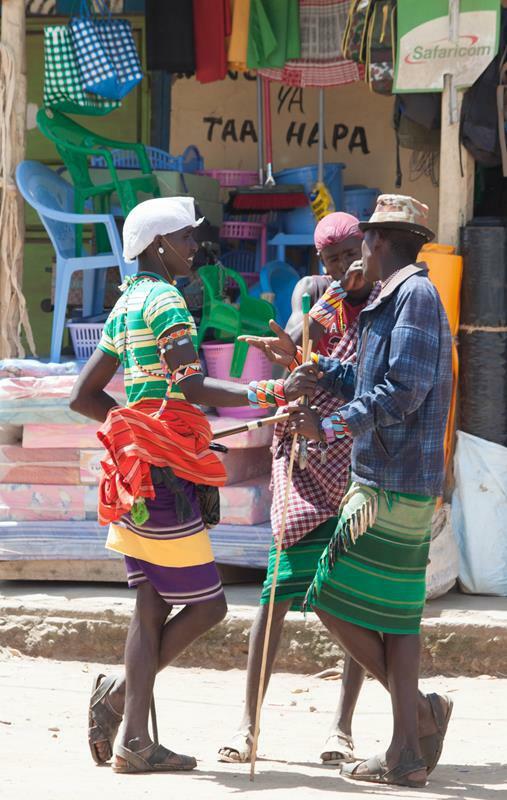 It is also home to the Samburu and Turkana tribes who add colour to the dusty town. 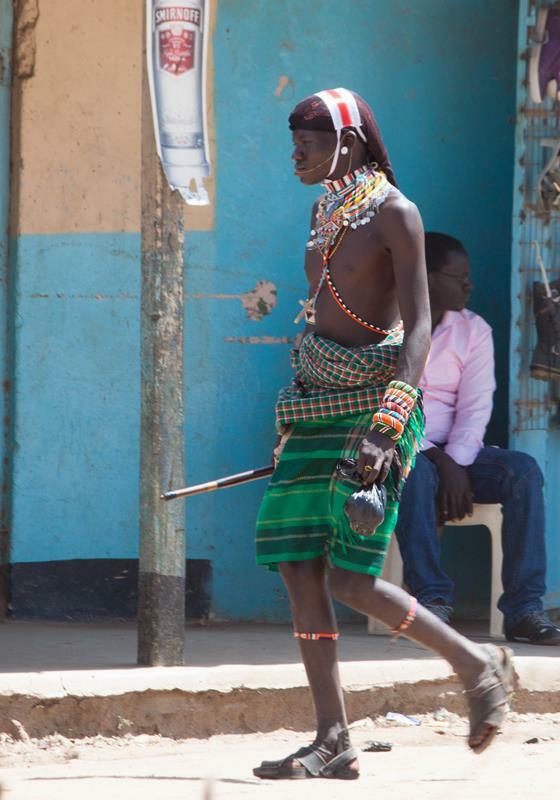 Samburu men.. the people adds colour to the otherwise dusty town of Maralal. We had met Jack, the owner, at Jungle Junction in Nairobi and knew that we could camp there, and were surprised to see zebra and warthog in the campsite as we drove in. The lodge is run in conjunction with a wildlife sanctuary and during our stay impala, zebra and warthog grazed around our campsite and we heard hyena during the night. The sanctuary also has Eland and cheetah. 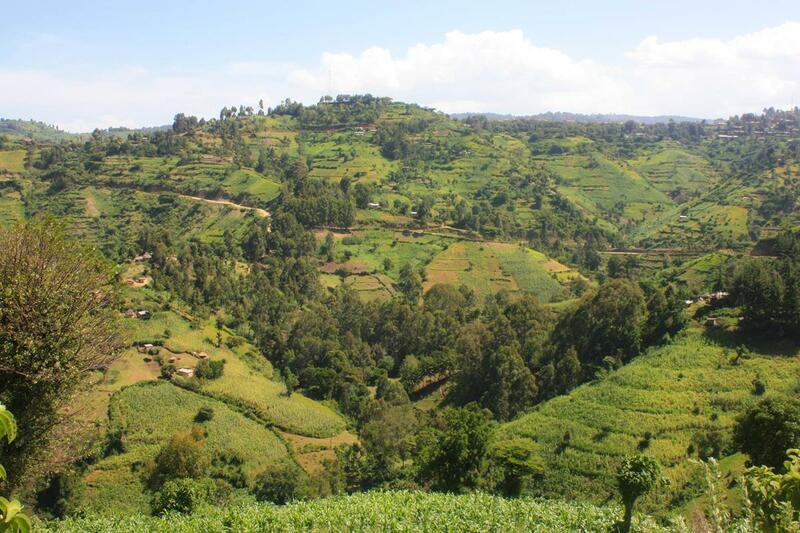 Looks really interesting, if you’re not too far away, try and visit Iten. All the Kenyan runners train there. Sounds like you’re having a fantastic time. Enjoy and take care.